On May 19, 2018, Meghan Markle became the newest member of the royal family as she exchanged vows with her beloved Prince Harry in a royal wedding that left the world breathless! And what a radiant bride she was, dressed in a gown that gave a nod to the tradition of royal weddings of the past while expressing her own unique style. To commemorate this historic union, The Ashton-Drake Galleries has captured her beauty with the exclusive Meghan, Royal Romance Bride Doll, a stunning bisque porcelain Collector's Edition doll inspired by the iconic ensemble worn on her wedding day. Standing at 16-inches high, this porcelain collector doll is an enchanting way to relive this real-life fairy tale romance! Exuding royal elegance, this true-to-life Meghan porcelain collector doll is handcrafted and expertly hand-painted to highlight her lovely features, and is poseable to perfectly showcase her unforgettable bridal ensemble boasting authentic details. From her magnificent white satin wedding gown with a bateau neckline and A-line silhouette to her dramatic drop veil blusher with scalloped lace, every nuance of her wedding day detail has inspired this exquisite bride doll. Her dazzling accessories including her bandeau tiara, stud earrings and sculpted bridal ring set sparkle with genuine Swarovski crystals, and her delicate bouquet completes her breathtaking look. Features This exclusive collectible Meghan Markle, Royal Romance Bride Doll from The Ashton-Drake Galleries features: Commemorate the real-life fairy tale romance of Prince Harry and Meghan Markle's historic wedding with the Meghan, Royal Romance Bride Doll, a Collector's Edition available exclusively from The Ashton-Drake Galleries. 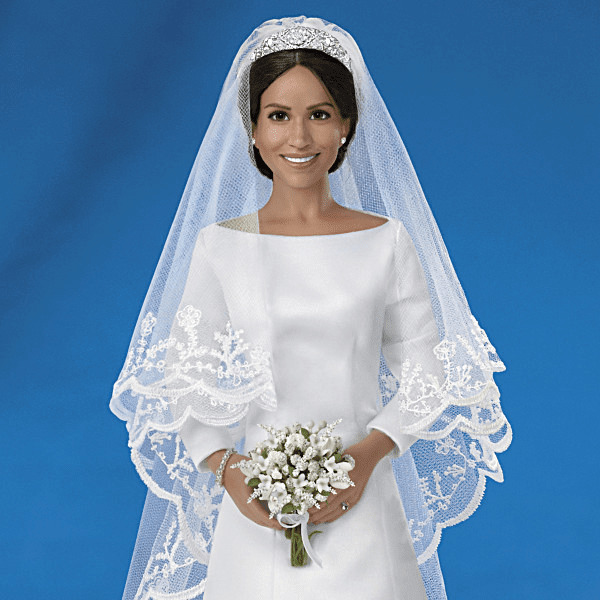 From her magnificent white satin wedding gown with bateau neckline and A-line silhouette to her dramatic drop veil blusher with scalloped lace, every nuance of Meghan's wedding day ensemble has inspired each authentic detail of the doll Her dazzling accessories including her bandeau tiara, stud earrings and sculpted bridal ring set sparkle with genuine Swarovski crystals for added romance, and her delicate bouquet completes her breathtaking look.